Kingdom Come Deliverance has officially been released, and what a game we have on our hands. I was lucky enough to be present at the official launch event where we spoke to Tobias, who works for Warhorse Studios and is a personal fan of the game. Tobias spoke with so much passion and desire for what had been created, and it’s easy to see why. In my opinion, it says a lot about a game when the developer is so inspired and motivational, the way he was speaking wasn’t as a professional, he was speaking as a gamer who loves Kingdom Come. After years of hard work, we finally have the game. In this review, I will be going through several points surrounding gameplay, storyline and overall feel to this exciting and compelling game. The developers have focused their attention’s on creating a historically accurate game. Kingdom Come Deliverance is set in the year 1403 and the game is based on a true story, this being a story of kings, heirs, a kingdom, castle sieges and bloody battles. You play as Henry, the mercenary army destroys your home and kills your family, you are the sole survivor of this horrible tragedy and it is here that your road to redemption starts. This game features a very open world environment and can be felt and seen from the start. There is so much freedom to go and do whatever you want, but you have your primary objectives to follow to progress through the game. The way you act and the way you conduct yourself through Kingdom Come Deliverance will spread by word of mouth, you need to watch what you do and say, otherwise there could be dire consequences. I love this feature, but it annoys me at the same time. This adds to the realism of the game and really brings Kingdom Come Deliverance to life. You can be running towards your next mission or peacefully strolling through the beautiful surroundings of Bohemia… all with a bounty on your head, and when the public attack, they attack with force. I can’t tell you how many times I’ve been confronted while playing this game, BUT I LOVE IT! The game consists of constant progression throughout the main aspects of the game. You need to allow yourself time to understand and learn the fighting patterns, or the pattern that suits you best. you can’t rush into battle and win so easily, you can try… but you won’t succeed. I come from games such as Assassins Creed where no matter if there is 1 enemy or 10… you will make it out alive. This is different, very different. 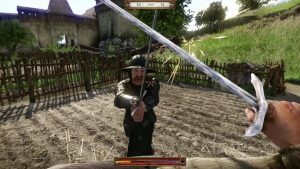 Kingdom Come Deliverance allows you to control every aspect of the fighting sequences. The left analogue stick is your character’s movement and the right analogue stick is the sword. Using this system, you are able to block any shot from an opponent, and obtain the ability to strike with a powerful shot, straight from a counter. If you choose to do this you need to be equipped with the right weapon, the right amount of armour and a way of replenishing your health if wounded. A fantastic and realistic touch for Kingdom Come Deliverance comes with the head gear armour. The more armour you wear, the more your site is compromised. Your vision becomes minimal, therefore running the risk of missing shots and losing the fight. This is a choice for the gamer, and it’s your choice alone. The path I follow is a mixture of both, defensive and aggressive. Kingdom Come Deliverance is a fantastic, engaging RPG that I can’t wait to play even more. The story is intriguing, the atmosphere is beautiful and this is going to be big. If you are looking for a new game to really sink your teeth into, this is the perfect game for you. Be sure to come back to Clubit for more exciting updates and further reviews on Kingdom Come Deliverance. Do you like Kingdom Come Deliverance? Let us know what you think in the comments section below.